Mainstream programming idioms intensively rely on state mutation, sharing, and concurrency. Designing type systems for handling and disciplining such idioms is challenging, due to long known conflicts between internal non-determinism, linearity, and control effects such as exceptions. In this paper, we present the first type system that accommodates non-deterministic and abortable behaviors in the setting of sessionbased concurrent programs. 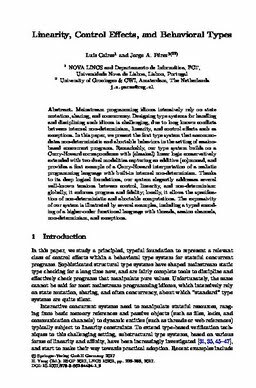 Remarkably, our type system builds on a Curry-Howard correspondence with (classical) linear logic conservatively extended with two dual modalities capturing an additive (co)monad, and provides a first example of a Curry-Howard interpretation of a realistic programming language with built-in internal non-determinism. Thanks to its deep logical foundations, our system elegantly addresses several well-known tensions between control, linearity, and non-determinism: globally, it enforces progress and fidelity; locally, it allows the specification of non-deterministic and abortable computations. The expressivity of our system is illustrated by several examples, including a typed encoding of a higher-order functional language with threads, session channels, non-determinism, and exceptions.